(Bloomberg) -- The number of U.S. farms that are either very big or pretty small grew during a period when agriculture incomes fell 22 percent, pressuring mid-sized growers whose debt skyrocketed. 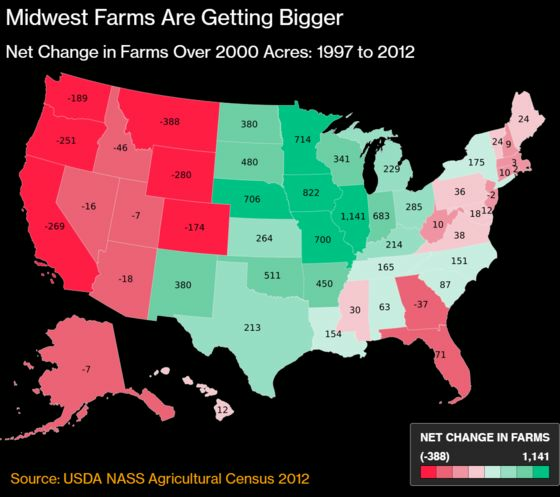 The first new U.S. agricultural census since 2012, released Thursday, offers a peek at America’s farming community in the five years ending in 2017, confirming that a decade-long trend of consolidation isn’t abating. The new report only captures part of a downturn that’s persisted into 2019, fueled by a trade war with China that’s limited buyers in a year with bumper crops. That’s boosted grower debt to a record $427 billion, spurring a continuing death watch on the mid-sized farm. The industry’s debt-to-income ratio is now the highest since the mid-1980s. The 2017 census data being released by the USDA provides a deep dive into grower demographics, from the sizes of farms by acreage and income, to the race and gender of those working in the fields. The last census, released in 2012, came just before net farm income peaked at a record $123 billion.